Each year the language specialists (Lektoren) at the International Youth Library (IYL), in Munich, Germany, select newly published books from around the world that they consider to be especially noteworthy. This list of books is compiled into the annual White Ravens list, which is introduced each year at the Bologna (Italy) Children's Book Fair. The White Raven label is given to books that deserve worldwide attention because of their universal themes and/or their exceptional and often innovative artistic and literary style and design. The titles are drawn from the books that the IYL receives as review or donation copies from publishers and organizations around the world. 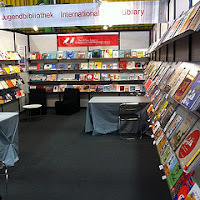 When I was attending the Bologna Book Fair (as part of my Bookbird editor duties), I had the opportunity to examine all the White Ravens books as the list was announced-- what a treat! I was able to study the poetry selections, in particular, and even photograph the books and last year had volunteers read poems from some of the poetry books in the different languages-- and I posted those mini clips. Such fun! 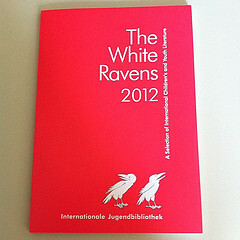 I wasn't in Bologna this spring, but fortunately the White Ravens list is searchable online. So, I've done the homework and have pulled all the poetry selections here for you below-- there's such a range in tone, style, and content. (Annotations from the IYL.) In the 2012 list, you'll find 18 books of poetry for children from Australia, Austria, Belgium (including a CD), Canada, and Haiti-via-Canada, Chile, Cyprus, Germany, Hungary, Italy, the Netherlands, Norway, Russia, Slovenia, and the USA. Enjoy! Here's the link to the complete current White Ravens catalog (2012). You'll also find more info at the International Children's Digital Library, a searchable database of thousands of international books for young people, including the White Ravens catalog. Melbourne [et al. ]: Penguin / Viking, 2011. –  p.
Wien: Wiener Dom-Verl., 2011. –  p.
Regina, Sask. : Coteau Books for Teens, 2010. – 196 p.
Montréal (Québec): Éd. de la Bagnole, 2010. –  p.
Santiago, Chile: Liberalia Ed., 2011. – 141 p.
Strobolos: Parga, 2011. –  p.
Leipzig: Klett Kinderbuch, 2011 –  p.
Berlin: Aufbau, 2011. –  p.
Budapest: Ulpius-ház K., 2011. – 73 p.
Un paese bambino. Poesie per il 150° dell’Unità d’Italia (A fledgling country. Bologna: Stoppani, 2011. –  p.
Milano: Topipittori, 2011. –  p.
Amsterdam: Leopold, 2011. – 87 p.
Bergen: Mangschou, 2011. – 183 p.
Moskva: Izd. dom Meščerjakova, 2011. –  p.
Dob pri Domžalah: Miš, 2010. –  p.
New York, NY: Abrams Books for Young Readers, 2011. –  p.
Boston [et al. ]: Clarion Books / Houghton Mifflin Harcourt, 2011. –  p.
Join the rest of the Poetry Friday fun at Jama's Alphabet Soup. See you there! Thanks for highlighting this list! So excited to see Laura Salas's BookSpeak included :). Thanks for giving us this glimpse into the book fair. It'd never heard of the White Raven awards before. I'm with Jama -- great to see one of our Poetry Friday friends on this list. I'm also going to check out the Canadian anthology of poetry by Haitian children. I've not heard of this, so thank you for telling about it, but also for the book blurbs. How exciting to see Laura's book on the list. It's a big honor! Thanks for stopping by, friends. Glad you enjoyed this international peek. I agree with you, Laura, the poets and publishers in many other countries do seem to be able to take bigger risks than we usually see in the U.S. I've seen that for several years-- plus poetry is a big deal in many other countries-- which is so lovely! What a wonderful list, and how exciting to see BookSpeak on there. I'm particularly pleased to see the two books in Italian, too, first because we're raising our twins bilingual, and also because (as a member of the town Chorale) I've participated in many 150th anniversary celebrations over the past year. These will be great to have in the collection! What a fantastic line up and collection, Sylvia! You truly are the premiere source of fantabulous poetry/story lists. Bologna sounds like so much fun, perhaps in some faraway distant time in the future, I'd be able to attend at least one. I've been hearing a lot about the Australian book you mentioned, the very first one, and I've also seen the book cover. So luscious! And of course we also love BookSpeak. In fact we are thinking of coming up with a book-about-books theme in honor of this lovely picture book. Sylvia, I have just found your blog. Thank you for highlighting the White Raven Award list, which is new to me, too. I am fascinated by the book descriptions. There is a different tone to these collections from around the world. How wonderful that Bookspeak is recognized!